do you seriously think that there should be extra coding in the application to address this? 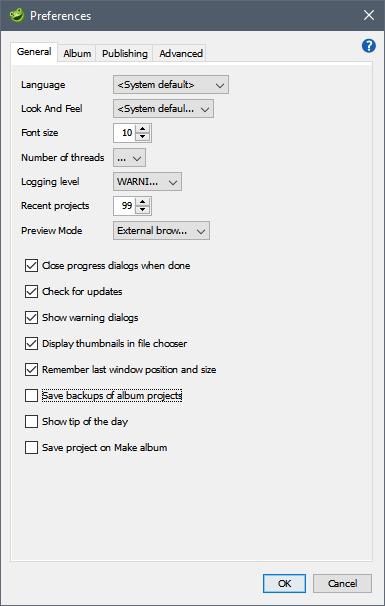 Yes, every user-friendly program uses the yellow mouse hints to help the user, except jAlbum which uses no mouse hints! David - make the minimum font size 10. Yes, I'll do that. 10 is small anyway. Font-size 10 does not display the contents of a combobox correctly. Some fields still have trouble at font size 10. Make the minumum 11. I've never seen any problem at that size. There are 159 tool tips within jAlbum, excluding the skins, so you can't say we don't have tool-tips. OK but on the difficult sections, the Advanced and Preferences sections, I don't see tooltips. In such a tooltip it is easy to indicate that a restart is required! The beta is now updated to release candidate 1. I recommend updating via the installer. Preview browser can occasionally hang while being operated on OS X Mojave. This is likely a bug in OS X Mojave or the underlying Java. Please see if you're able to provoke the preview browser to hang while clicking around in albums via it. Thanks for notifying me about that Karl! In the target URL text-box I can enter https://andrewolff.jalbum.net/Onze_Tuin_embedded_FB/ and click the update button. I get in that case no handshake_failure error as reported here and an image is showed in the window. But if I click next the OK button, the new page is not visible in the Explore. To make it visible in the Explore I have to press the F5 key. I can too make web locations in this case with links: https://andrewolff.jalbum.net/Nepal_Embedded_FB/ and https://andrewolff.jalbum.net/Almelo_berijpt_embedded_FB/ but also in these cases I have to use F5 to make the results visible in the Explore. However if I do this with a link outside the jalbum.net domain, like https://www.andrewolff.nl/FotoSerie/AlgarveSlideShow/index.html I get the above reported handshake_failure error. It is possible to add this link via drag and drop, but no thumbnail image is shown for that web location. If I next remove the last added web location https://www.andrewolff.nl/FotoSerie/AlgarveSlideShow/index.htm and make the album again I get no handshake_failure message in the system console. If I next add link https://www.andrewolff.nl/FotoSerie/AlgarveSlideShow/index.htm again via drag and drop and open that weblocation and add an image via the browse button after the the Image URL, I can make the album without handshake_failure messages in the system console. I can't reproduce this (v17.1). I've tested to add both the reference to your profile page on jalbum.net and to your own site. In both cases I don't get any handshake error and the thumbnail shows in the explore view. I've been testing on Mac, Windows 10 and Mint Linux. I'm still getting the handshake error when trying to add https://jgromit.com as a web location. The only way to make it work is to use the workaround I outlined earlier - use example.com, then edit the .webloc file after the fact to insert the correct URL. ETAETA: Although why anyone would want to link to that awful site is a complete mystery. Apparently I have a very special Windows 10 system, because this is not the first time that you can’t reproduce the bugs I found. If I add https://jgromit.com, which is also outside the jAlbum.net domain, via New page / Web location and update I get the handshake error. If I next add the picture via the browser button and click OK, the new weblocation is not visible in the Explore, untill I press F5. But in that case the selected image is not displayed. Based on the evidence of the last decade or so, that has become our default assumption.